Yeah, they're done and I am really happy with them. I made these as a Christmas gift (trying to be ready for the holidays this year), but I really wish they were for me! I don't enjoy knitting a second pair of the same sock pattern, so I guess I'll make myself a different pair of socks in the same yarn sometime soon. 1. Changed the provisional cast on to Magic Cast-On. 3. I continued with St St up the front of the shin and ribbing in the back. I did ribbing all the way around for the last inch--probably should have ribbed 1 more inch. I am really excited to start my next Yarnissima pattern: "La digitessa". Unfortunately, they probably won't be cast on until June because I have 2 other pairs of socks in the queue for April and May. Very nice! 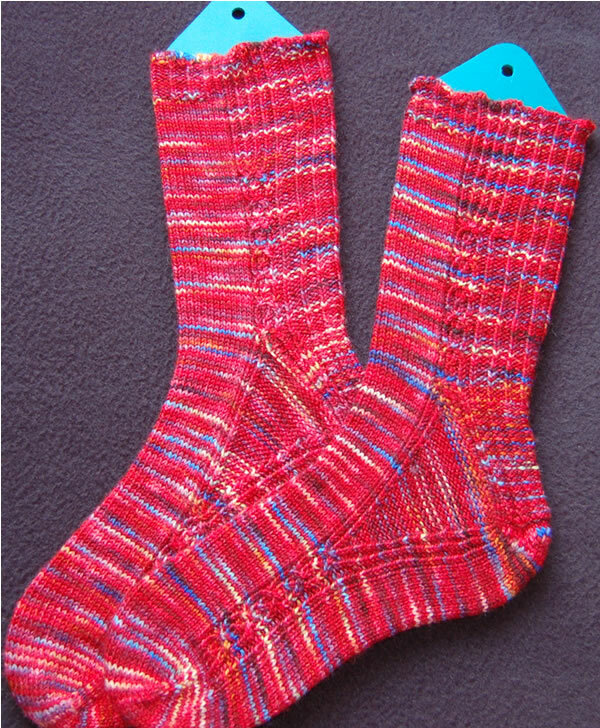 I have some rockin' hot Cherry Tree Hill in bright orangey/red to make a pair of these.